Sugata Sanshirô is recognised as a cult classic, it spawned a sequel and more than one remake but I fail to see the mass appeal of this one. It tells the story of a man who finds himself through Judo. He trains and becomes a sensation but he finds conflicts between his passion and his heart. 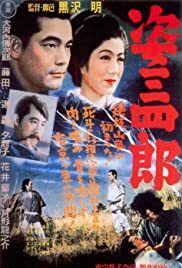 It's an odd little tale, light hearted compared to many of the early Tojo films but still has the recurring theme of honour above all else. In a modern age the concept being taken to this degree doesn't translate well, in fact it comes across really quite daft. The judo sequences are oddly over the top, the plot is thin and though it's hardly terrible I certainly don't "Get it".